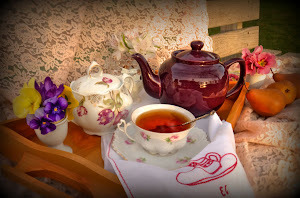 Share your favorite teatime recipe for sweets or savories. 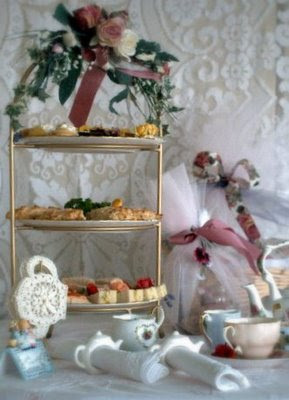 Tea sandwiches, scones, and dainty desserts all count in this category. Give credit to the originator of the recipe if possible. Post a picture if you can. 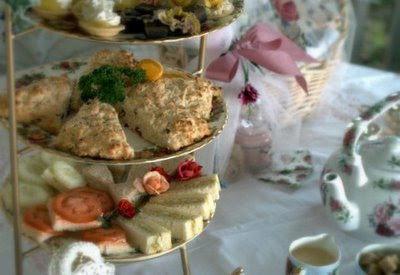 This is sure to make everyone hungry for a delicious tea time treat! 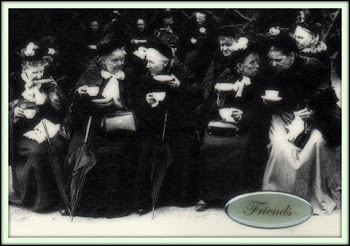 Ideas for recipes to post this week are: scones, crumpets, shortbread, cookies, baby cakes, tarts, tea sandwiches, soups, salads, fruit treats, jams, jellies, curds, and creams. I'm looking forward to the recipes you choose to share! 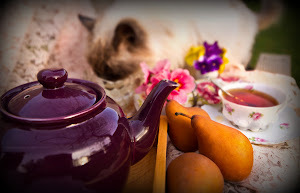 It's too bad we can't make a 'potluck tea party' with each of us actually bringing the foods represented by our recipes to tea! 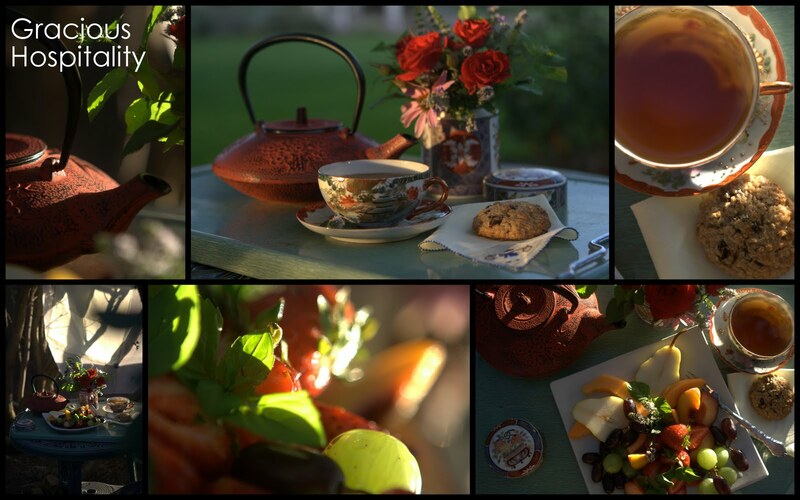 The pictures this week are from a 'back porch' tea for two that I prepared for my friend and neighbor, Karleen. It was her birthday and we enjoyed a relaxing time together. 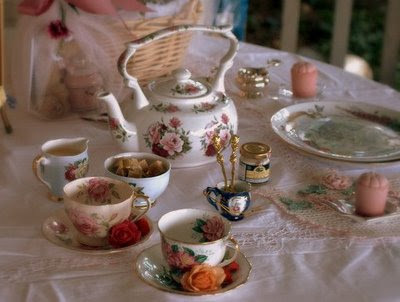 A tea pot luck would be the best! Did you stage all thsoe photos yourself? They are gorgeous! Your pictures are so beautiful and the recipes sound so delicious. I was wondering if that was your Tea Table? 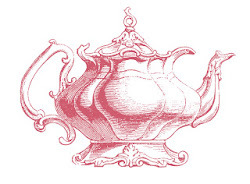 Can I come over for Tea? I've posted a few recipes and will probably post more later. I am enjoying this so much! Thank you for hosting. My husband thanks you also as I had to make scones yesterday to photograph. I am looking forward to seeing all the great recipes this week. Hi LaTeaDah...I posted for this week and last. 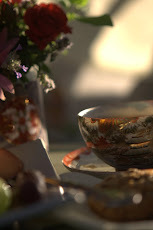 Your food and table looks so wonderful...when is your next tea? I would love to join in the fun! Beautiful images! And it looks luscious. My scone recipe is up! Great idea! I posted over on my blog (www.fabricpaperthread.blogspot.com). And I'll try to put more up during the week. It all looks so lovely La Tea Dah! I've purposely not gone visiting until I posted this because I thought I'd become overwhelmed by the bounty and the beauty. LOL! As always, La Tea Dah, thank you for being such a great hostess! Oooh, a part of the blog-a-thon I CAN participate in! I may not have tea linens or creativity to write a teacup story, but I CAN cook and bake! Dearest Most Gracious Hostess, can you give me info on how to paste the blog-a-thon logo on my blogsite? I am new to blogland, but have lurked on your blog for the last couple of weeks. Absolutely love your blog!!! You truly are a gracious "hostess" in gracious hospitality. Hehehe, it is the right link to my blog but the title still has my Mr. Linky from Semicolon's blog! Good Morning LaDonna, I've post my recipes on my blog. I've entered my name and address into Mr. Linky but when I click on my name is goes to some other site! Can you fix this or should I try again? Help! It's me again. I just realized the problem...I didn't type in my blog address correctly..duh! So, I tried again and everything is o.k. Sorry about that! Just posted my sweet-and-savory of yummy! Hope you enjoy it! 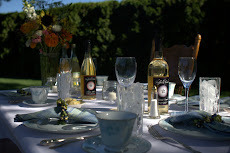 I have been enjoying your outdoor tea party photos - they are beautiful! I did not make it to this week's topic... I just had too much going on. Just wanted to tell you that your recipes are so tempting and the photographs are gorgeous! 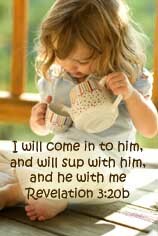 I always feel as if I am right there at your tea parties... Thank you for the inspiration! I finally got some recipes done and posted only a couple of days late. I'm sorry to be posting late in the game; but, they say better late than never. 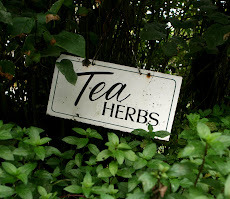 I've been busy,too, planning a Mother-Daughter Garden Tea for later this month. I'm gleaning lots of wonderful ideas from this blog-a-thon. Thank you! I wrote this in time, but was delayed by problems with photos.